Rubbish Removal of general waste from a deceased estate at Lane Cove was one of our many jobs this week. A total of four loads taken away, with various general belongings and furniture. This all on one of Sydney's most hottest days this summer with temperatures reaching 38 degrees celsius [caption id="attachment_698" align="alignnone" width="225"] 1 of 4 loads at Lane Cove[/caption] In addition when AAA Mr Rubbish Removal Sydney comes to your home or business we will always intend provide a high quality service and customer satisfaction. Because we have 17 years’ experience in Sydney and excellent references we’re sure you’ll be happy working with us. Obligation free competitive quotes are offered. With a fast on-time same day service. We turn up when we say we will. 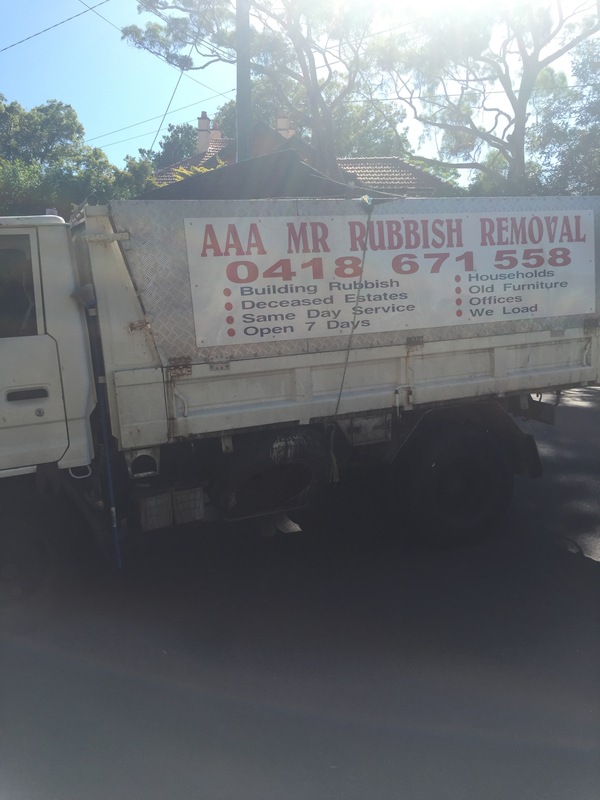 AAA Mr Rubbish Removal Sydney has been removing rubbish from Sydney homes and offices and have never met a challenge we couldn’t complete. No job is too small or too big or too difficult. Where there is a will there is away. Our company is familiar with working with all council regulations regarding the safe disposal of goods. We work closely with body corporates and strive to minimise disruption to you and your neighbours. We guarantee a stress-free, simple and professional rubbish removal service. Rubbish removal isn’t a matter of just loading and tipping. Regulations for green waste, scrap metal, paper product waste, and general waste, to name a few are separated at the tip. Extra charges are enforced at the tip for flammable products paint cans and mattresses. Cleaning up around the home and office should be done on a regular basis. Doing so will reduce your costs when it is time to move on. No matter what your situation or where you are in Sydney. At AAA Mr Rubbish Removal Sydney we are here to help you get rid of all of your unwanted goods, no matter how big or small the amount. In conclusion the real estate agent was happy with the result and we were happy to help people through a difficult time.